Earth is inside a solar wind stream flowing from the indicated coronal hole. Image credit: SOHO Extreme UV Telescope. QUIET SUN: The sun is blank again--no sunspots. Solar activity should remain very low. Also known as light pillars, false auroras are caused by ice crystals in the air, which intercept urban lights and spread them into colorful columns. 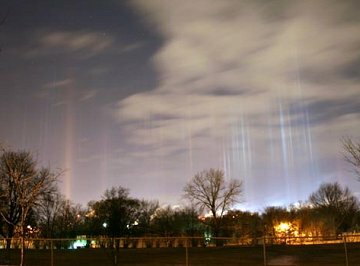 "These were the most dynamic and beautiful light pillars I have ever seen!" says Gavan. Conditions in Kalamazoo were ideal for these pillars. "The temperature was around 5o F, and the air was filled with very fine diamond dust ice crystals." Hoarfrost is winter's substitute for dew. It forms when the air is moist and the temperature of the tree is below the dew point. 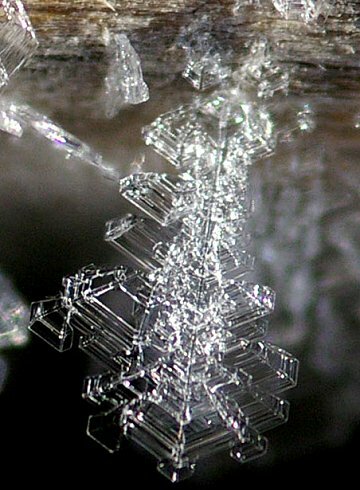 The resulting crystals are so delicate that the slightest amount of direct sunlight can vaporize them. "I found these hiding between the planks of my deck," says Robertson. more images: #1, #2, #3. You are visitor number 33764363 since January 2000.